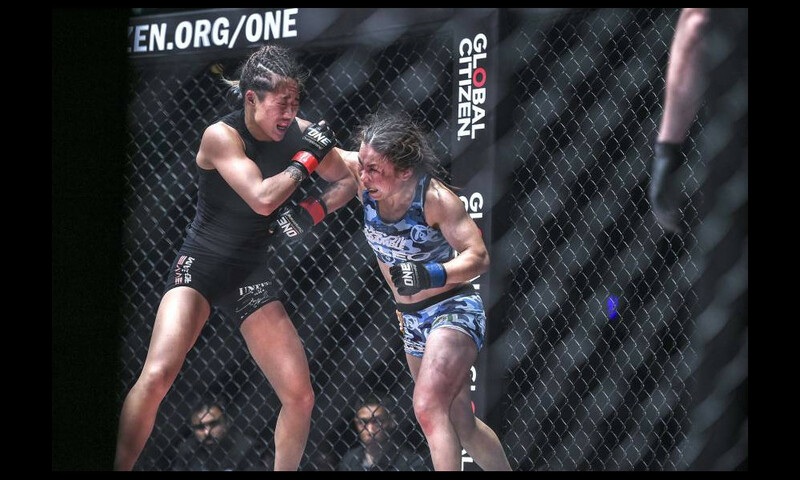 SINGAPORE – Atomweight champion Angela “Unstoppable” Lee and Japanese veteran Mei Yamaguchi fought another closely contested main event before a sellout crowd of 12,000 during a ONE Championship at Singapore Indoor Stadium. At the end of the fight, the winner was the same as two years previously, when Lee captured the inaugural championship. Lee remained unbeaten in her career (9-0) after a 3-0 decision. It was certainly a discouraging result for Yamaguchi, a fighter with a background in karate and Brazilian jiu-jitsu. Although she did not lose her composure, Yamaguchi, who looked to have the momentum in the final two rounds, thought the victory belonged to her this time. But at the same time, the 35-year-old knew she needed a huge performance to beat home favorite Lee, who was born in Vancouver and raised in Hawaii but fights under the Singaporean flag (The event had the subtitle “Unstoppable Dreams,” which was probably derived from Lee’s nickname). Nonetheless, Yamaguchi felt a measure of satisfaction because she had the privilege of headlining the event. Perhaps Yamaguchi’s name (she is known by the nickname “V.V”) and face are more recognized in Southeast Asia than in her native country at the moment. Japan was once the biggest MMA market in Asia, probably even in the entire world. But Southeast Asia is currently a hotbed for the sport, with ONE Championship as the mainstream promotion. ONE Championship is on a steep growth curve. The organization was founded less than seven years ago by Chatri Sityodtong and Victor Cui and has gained a big following in Asia. As one indication of ONE’s rapid growth — explained at a news conference hosted by the Singapore-based MMA company and Nielsen earlier in the day of the Unstoppable Dreams event — the company’s social media impressions have gone up by 5,298 percent since 2014, from 352 million to 19 billion. So it can’t be considered as just a local Asian mixed martial arts promotion. It is projected to soon hit the $100 million mark in terms of annual revenue. According to Bloomberg, ONE is on track to obtain a valuation of about $1 billion in its latest round of funding. MMA often has a brutal public image. Yet ONE has a surprising client roster that includes global brands like Disney, Canon, Under Armour, Sony, LG and Facebook. ONE Championship now is aired in 136 countries around the world. It is broadcast by Fox Sports Asia, a cable station in Singapore, Thailand, Malaysia, Vietnam, the Philippines, Indonesia and other Asian territories. Speaking before the May 18 event, Sityodtong admitted he did not expect his organization to “become the largest sports property in Asia” when he launched it. “I cannot say if it was planned,” said the ONE chairman and CEO, who is now considered to be one of Asia’s next-generation tycoons. “That was luck. In professional fighting, Ultimate Fighting Championship is the world’s most prominent MMA promotion. But ONE is trying to differentiate itself from UFC with its own Asian values. In an interview with Forbes earlier this year, Sityodtong insisted he would try not to project a bloodsport image, adding that “swearing and people who throw water bottles in press conferences” does not work in Asia. At the end of the day, the fight formats and rules are similar between ONE Championship and UFC, both of which contest bouts in a caged circle. Fighters still throw punches, kick and strike opponents with elbows, just as they do in UFC. ONE fights can also be just as violent. But ONE is attempting to promote its values outside of the ring. Just hearing how he talks about his promotion, Sityodtong chooses polite words to enhances the brand. The Thai national repeatedly emphasizes that martial arts are part of “our culture” and “our traditional values.” He says they are deeply rooted in Asia, where each country has established its own genre, such as karate in Japan, kung fu in China, Muay Thai in Thailand, to name just a few. Sityodtong, who has an MBA from Harvard Business School and served as a hedge fund director before he founded ONE, said UFC has primarily controlled North America, Brazil and Australia, while ONE is the largest in Asia. In the week ahead of the May 18 event, ONE announced something unprecedented. Through a smartphone app, ONE now gives fans access to live events and its library of digital content for free, which Sityodtong claims no major sports property has ever done before. Sityodtong added that the “super app” would give “massive exposure” to ONE’s athletes, brands, sponsors and broadcasters, and is “a win-win” situation. ONE Championship has, however, been a stranger to East Asia in terms of hosting events, with the exception of China. But it is set to try to break into the Japanese market next March, at a venue yet to be announced. Japan used to have a flourishing MMA scene with PRIDE Fighting Championship and K-1 in the 1990s and early 2000s. ONE has recently announced a broadcast partnership with AbemaTV, an internet channel developed by Cyber Agent and TV Asahi. “Moreover, we have the right Japanese partners in Japan to succeed and make it even bigger than PRIDE was, and take martial arts back to the mainstream, where it belongs in Japan,” said Sityodtong, who is half Japanese, and overcame poverty after his father left his family when he was younger (Sityodtong also took summer courses at Keio University and International Christian University in Japan). It has been reported at least one pair of Japanese fighters are guaranteed spots in each ONE Championship event because of the AbemaTV deal. Japanese star grappler Shinya Aoki, who gained fame through his days in PRIDE and DREAM in Japan, warned it would not be easy for ONE to break the status quo. Ultimately, ONE is not just competing against other MMA organizations. It is going up against every major league in the world, regardless of sport. One circuit Sityodtong often refers to is the NFL, which is the world’s most valuable sports property today. And he “genuinely” believes that his promotion could one day overtake that Goliath to become the world’s biggest presence. Sityodtong said that the NFL is a “single-sport sport” in a country with only a few hundred million people, while Asia is the home of martial arts with a 5,000-year history and has a population of 4.4 billion. “If 4.4 billion people download the ONE Championship app and watch it, I don’t think I have to worry,” said Sityodtong, who said ONE is “neck to neck” in terms of some key metrics (according to Nielsen, ONE has a potential global broadcast reach of over 1.7 billion while Formula One has over 1.5 billion). Maybe the subtitle for the May 18 show — “Unstoppable Dreams”— was not only meant for Lee. Perhaps it also referred to ONE itself, whose growth does not seem set to slow down in the foreseeable future.